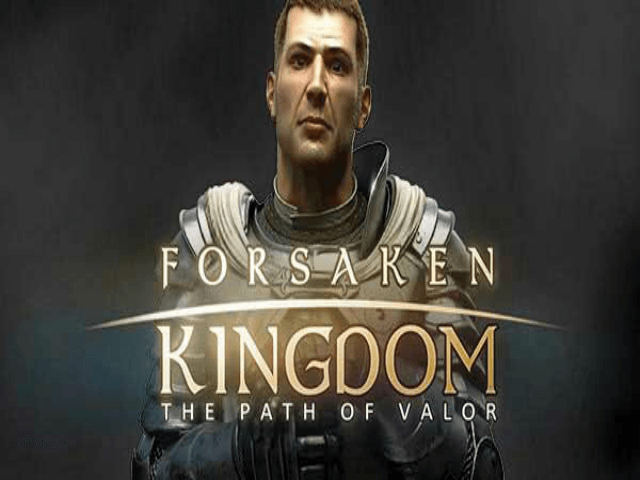 A name like Forsaken Kingdom: The Path of Valour conjures up images of a real adventure – and for all the heroes among you, this game doesn't disappoint. Based on the much-loved legend of King Arthur, it delivers sword and sorcery across five reels and 20 paylines. Made by Rabcat software, it's a game that pushes slot gamescapes to a higher level, with plenty of bonus elements to the game, free spins, multipliers and a big jackpot should you happen to pull Excalibur from the rock. 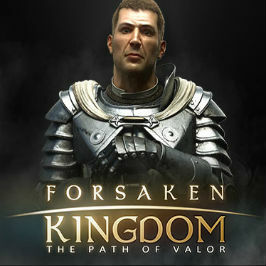 Forsaken Kingdom: The Path of Valor has the look of a videogame with 3D graphics and sound effects akin to a high-quality RPG. Rabcat describes the game in its own words as "defining the very peak of our game development and visual production capabilities. 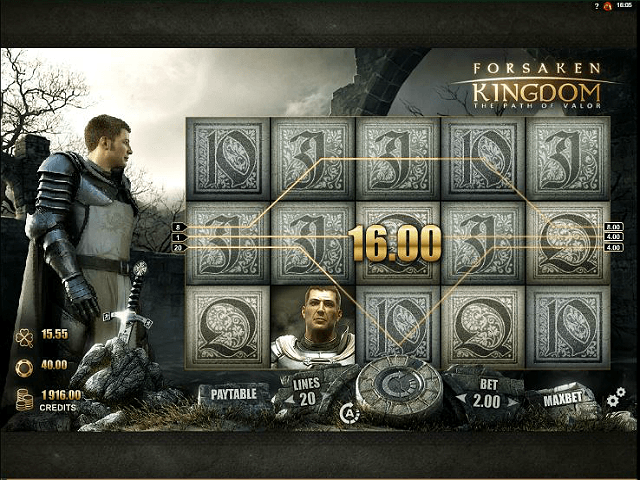 This premium video slot contains ingenious game mathematics and offers a great cinematic experience to the gaming audience." The gamescape takes you into the sacred land of Camelot, festooned with grey skies, castles, magicians, dangerous dark knights, beautiful maidens and of course, Arthur Pendragon. Arthur struts moodily around the reels with Camelot behind him — he looks fairly grumpy to start with, but comes to life if you start getting some wins to help his quest. 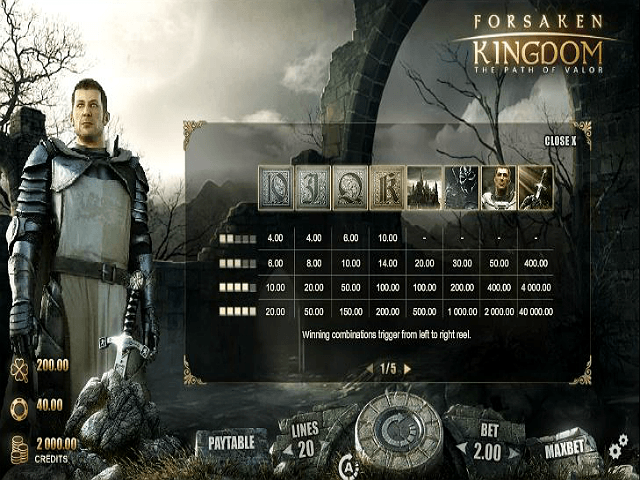 The game features five refined reels and 20 paylines, with symbols including the Castle of Camelot, Arthur, Dark Knight, Letters, Numbers and the mighty Excalibur sword spinning across the screen for base game payouts. The game also includes a Wild in the shape of Guinevere, bonus win combinations and a Shield which is the key to the fun and rewarding Round Table of Fortune feature. With a 96.54% return-to-gamer ratio, this slot certainly comes up to scratch for fair gambling. Rabcat's heroic slot can be spun (with all 20 paylines) from 0.20 to 40.00 – either manually or via super-fast auto-spin. Although the game features no progressive jackpot, the Excalibur symbol pays out handsomely, with a jackpot of 1,000x your stake for five icons. Guinevere acts as Wild on the middle reels to complete winning combinations – as well as potentially covering the whole reel. Bonus rewards are paid for spinning special combos – either match Arthur and the Black Knight on the top row, or Arthur and Guinevere. The latter duo triggers the Eternal Love reward which payouts a beautiful 5x your total bet (ah, so that's the price of love). The shield scatter icon launches the slick Round Table of Fortune Bonus. To trigger the bonus game you need to collect 12 knights on the metre beneath the reels, with a knight awarded every time you match two on a spin. Each knight has a different value and it's weighed at the table to give you a multiplier prize depending on which knight's chair the light stops on. Spinning bigger stakes will boost the multiplier wins awarded. Spinning three or more shield scatters activates the free spins bonus, giving you five to 12 free plays. The feature doesn't contain extra bonuses but it does give you a nice wad of free spins. 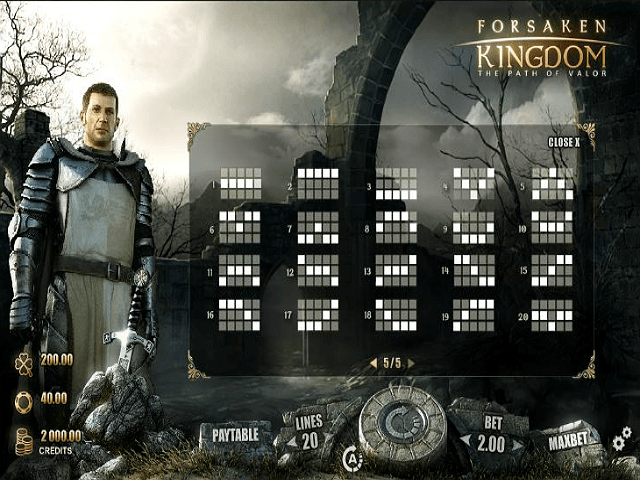 The magic verdict: Forsaken Kingdom: The Path of Valor will appeal if you love slots that look like video games but don't sacrifice on payout potential and regular slot features. There's no progressive jackpot, but the maximum win is still pretty tasty. If you like Forsaken Kingdom - You'll like these slots too!